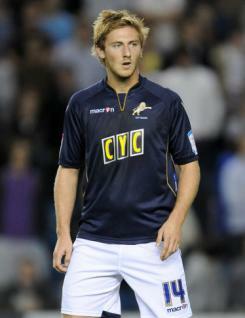 Speedy outside right James Henry became an instant hit at Millwall after signing permanently in July 2010 after producing a devastating display against Hull City in the first home game of the 2010-11 season, which the Lions won 4-0. James has an excellent turn of pace and his crossing while on the run is just one weapon in his armoury. He had a very consistent campaign for the Lions although the fans would like to see more goals from him. James has been capped at youth level by both Scotland and England and if he continues to be produce the goods then further international honours will surely follow.